Sydney is the biggest city in Australia and, to the uninitiated traveller or passing corporate stopover, making sure you’re in the right area for your needs can be daunting. We’ve made it easy for you with our simple and easy to use interactive map. All you need to do is find the price and location that you like and give it a click to find availability, facilities and an overview of the property. Airport Link is Sydney’s airport train which can take you from both international and domestic terminals to the heart of the city in just 13 minutes. 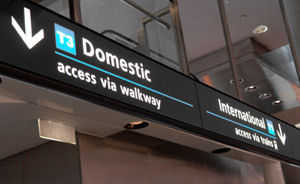 So, if you need quick and easy access to the airports as well as wanting to soak up the atmosphere in this modern, historical and cosmopolitan capital, there are budget hotels, affordable apartments and 5 star luxury suites and rooms that are just moments from Central Station and Wynyard that would be perfect for you. Many Sydney CBD hotels have secure underground parking and resort style facilities such as gyms and fitness centres, rooftop pools and stunning views from balcony rooms. Sydney airport hotels with a "SOLD" display have no availability at this time. If your stay will be longer than 14 days then you may be eligible for special "long stay" rates. Check out our Sydney Airport Long Stays page to find out if we can get a better deal for you.